Come Join Us At Either Location To Enjoy Our New Selections! We Now Have Growlers For Sale At Our Plainwell and Wayland Locations! We are currently hiring Servers & Cooks at both locations! Also we are looking for Managers & Delivery Drivers at the Wayland location! JOIN OUR NEW SALVINOS VIP CLUB! Text 57711 with SALVINOS1 to receive offers and promotions from the Wayland location. 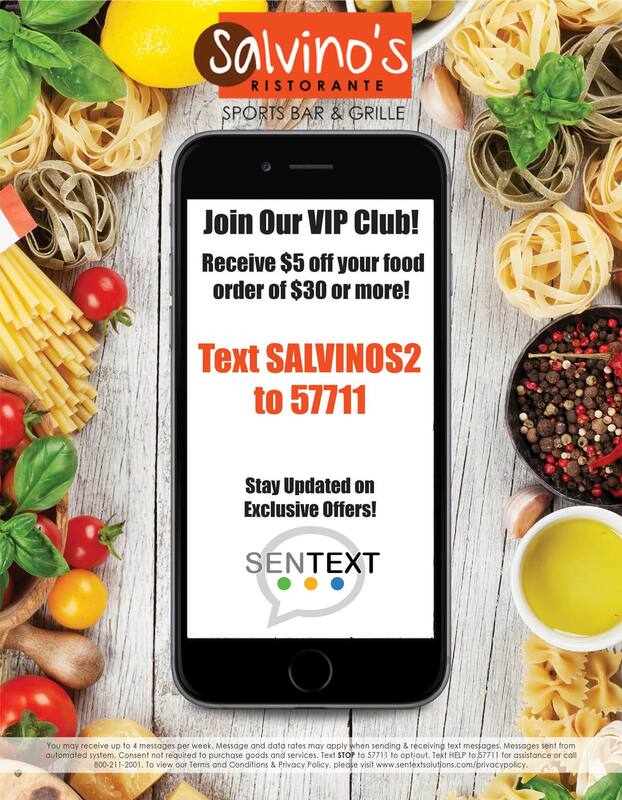 Text 57711 with SALVINOS2 to receive offers and promotions from the Plainwell location. Salvinos is your local Italian-American restaurant that is always serving up the best Italian and American dishes with freshest ingredients available. If you are looking for a great family friendly restaurant for dinner tonight, you have come to the right place. We have a great dining room for you and your family to enjoy your favorite Italian or American dishes. Although we offer the best when it comes to your favorite Italian dishes, we also offer all of your American favorites. Whether you are in the mood for a delicious homemade lasagna or you are in the mood for a perfectly cooked steak, Salvinos has got you covered. Our menu ranges from traditional Italian to American, and even a little Mexican! Italian Restaurant or Sports Bar? We've Got Both! We know everyone enjoys a beer while watching the game. We have six 120-inch TVs that line the walls of our sports bar so you are sure to catch every minute of the big game! While you watch, enjoy one of our 40 beers on tap, or choose from our extensive wine list. We serve the full menu at our bar, as well. So make yourself at home and come grab a beer with dinner while you watch the game at Salvinos sports bar. Copyright © 2019 Salvinos, all rights reserved.